If you recently finished your kitchen remodel but it feels like something is missing, there are many different finishing touches that can help enhance your kitchen. These minor details can help transform a normal kitchen into something much more modern and extravagant. Here are some of the possible finishing touches you can utilize when finishing your kitchen projects. Installing custom hardware for your cabinets can immediately transform the look of your room. Whether you are interested in something vintage, or perhaps something much more modern, there is sure to be a custom cabinet hardware solution that meets your design preferences. As a dealer for Waypoint Living Spaces®, we have the unique opportunity to offer a multitude of different hardware options. 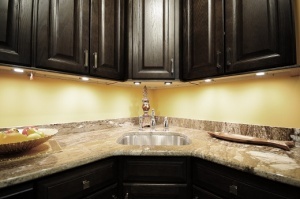 Installing lighting underneath your cabinets is one of the easiest finishing touches that can modernize your kitchen. With the rise of smart home technology, there are now Wi-Fi-controllable LED strips that are easily hidden, yet provide a variety of color choices to the homeowner. If it can be fit into your budget, installing undercabinet lighting during your kitchen remodel will make your kitchen your favorite room in the home! Crown molding can completely transform a room to provide flare to the finished top edges of your kitchen. Capping your custom cabinets with crown molding can create a sleek cap to enhance the appearance of your installed custom cabinets. Crown moldings can be painted or stained to meet the specific design of your kitchen, making them a great addition to the kitchen or any other room in your home. Adding an accent wall to your kitchen is a great way to add a splash of color and break up neutral color patterns. For instance, if you have subway tile as a backsplash but have one wall that doesn’t have a backsplash, paint that wall a bright color to add some design fliar to the room. Accent walls can be as creative or basic as you want, just make sure they are a wall that works with the overall design of the kitchen. If you are in need of a new look for your kitchen or bathroom, TimCo Construction would love to explain our excellent remodeling options in greater detail. To find out more about our remodeling options, contact us, or give us a call at 918-779-7330. Previous Previous post: Is It Time To Upgrade Your Kitchen Flooring?